Celebrating its 20th anniversary this year, the Kalpa was created with a specific case shape in mind, and a movement adapted to fit its unique dimensions. Michel Parmigiani was still celebrating his new role as a brand owner - he founded Parmigiani Fleurier in 1996 - when he envisioned a watch driven by the practical consideration of comfort and ergonomics. “I wanted to create a piece whose dimensions were as universal as possible, a watch that can be worn comfortably on any wrist,” he recalls. Pointing to a Kalpa on his own wrist, he alludes to the fit that is so well proportioned that you could hardly feel its weight. Once the case design was finalised, attention shifted to the movement resulting in one of the few deliberately tonneau-shaped movements in the industry. It was also Parmigiani Fleurier’s first in-house movement, a manual wound with 8-day power reserve made possible by two series-mounted barrels. “When you consider the horological masterpieces of the past, you never find any discordance between the movement and the case,” says Parmigiani, who spent years working as a watch restorer. “You never see a round movement in a tonneau case. The shapes were in harmony because the elements of the watch were produced simultaneously,” he further adds. The result was the Kalpa Hebdomadaire, Parmigiani Fleurier’s second wristwatch, which has since become a mainstay of the brand. To celebrate its 20th anniversary this year, the Kalpa Hebdomadaire has been updated with the new tonneau-shaped calibre PF442. Awarded the Fleurier Quality Certification for reliability and excellence in craftsmanship, PF442 maintains the signature 8-day power reserve with a weekly indicator at ‘12’. It also powers a small seconds counter at ‘6’ and a date aperture just below the power reserve indicator. Beautiful finishes appear on the movement, which is visible on the caseback, as well as the dial, the latter featuring opaline finish in the centre and handcrafted braid-effect guilloche on the flange. 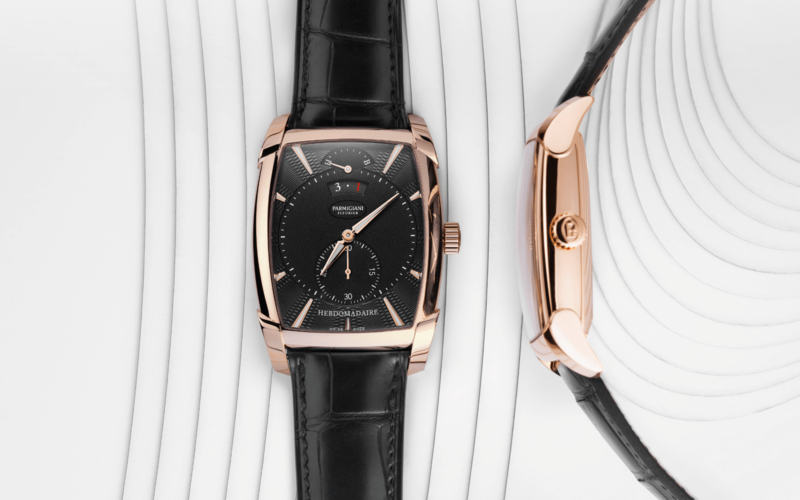 The watch, which measures 42.3mm x 32.1mm, comes in 18k rose gold case and a Hermes alligator strap with rose gold folding buckle.